Halunen Law, based in Minneapolis, Minnesota and with an office in Chicago, Illinois, brings fierce advocacy and successful outcomes to employment, consumer, and whistleblower cases. For more than 20 years, our firm has represented clients who experience harassment, discrimination, wrongful termination, wage and hour violations, retaliation, or other illegal actions in the workplace. We recognize the courage it takes to challenge an employer for unlawful acts, to demand a fair severance, or to blow the whistle on wrongdoing. Our attorneys guide clients through the legal process with expertise, close communication, and compassion. From an initial free consultation to case conclusion, clients receive personal attention. We take time to get to know our clients, hear their concerns, answer questions, and outline a path forward. Halunen Law's dynamic founder and leader, Clayton Halunen, has spent his career righting wrongs. He has built a nationally recognized and highly respected law firm known for its tenacious team of attorneys, proven record of getting results, and dedication to creating meaningful social change. Halunen has been selected to the Minnesota Super Lawyers list for 16 consecutive years. He was featured in the CBS television series ‘Whistleblower,' for his successful representation of client Heidi Weber in her case against Globe University. He was named to the "Top 100 Trial Lawyers" list by The National Trial Lawyers, and has been twice recognized as an Attorney of the Year by the Minnesota Lawyer. Whistleblowers also find expert guidance and experienced advocates at Halunen Law. Our firm has a dedicated practice group focused on bringing False Claims Act (FCA) cases alleging fraud against the Government. The FCA group represents courageous whistleblowers and qui tam clients across the country who have blown the whistle on many different types of fraud including Medicare, Medicaid, other health care, pharmaceuticals, small business, government procurement, grants, education, and defense. The FCA team brings a proven record of successfully navigating these complex cases and has achieved multi-million dollar settlements on behalf of their clients. Halunen Law's commitment to its clients is rooted in shared values. "We are strategic, collaborative, passionate, and results driven," said Halunen. "Our attorneys embrace these core values in their work every day." 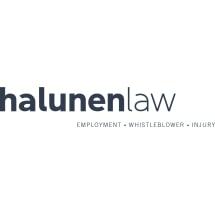 If you feel you've been impacted by unlawful practices in your workplace, or are considering bringing a whistleblower or retaliation claim, we encourage you to contact Halunen Law to discuss your legal matter.